Thanksgiving Stuffing in the Crock Pot – Free up some of that precious oven space on hectic holidays with this stuffing in the crock pot recipe! The few times I’ve hosted a large holiday dinner, I’ve realized that what stresses me out the most is oven space. For years growing up, I watched the women of my family jostle vintage pyrex bowls – which weren’t old enough to be vintage at the time – around a gigantic turkey in a single oven. How else could they get every one of the 12 side dishes out on the table, hot and at the same time? Plenty of fingers were stuck in my food to test the temperature, only to have the dishes hastily recovered with foil and shoved back into the oven. So when I came across a recipe for Thanksgiving stuffing in the crock pot, I about died. WHY, in 2014, was this the first time in my life that I’d ever heard of such a brilliant idea? I mean, slow cookers have been around since the beginning of time (or you know, the 1970s). I’m just now hearing about how to make Thanksgiving stuffing in the crock pot? While this radical idea won’t necessarily completely fix the dreaded holiday oven space issue, it’s meant to alleviate it. Especially if you’re not into stuffing your bird full of, well, stuffing. So I guess this recipe is more for Thanksgiving dressing since it’s cooked on the side. But really, who cares what you call it? It’s fantastic!! 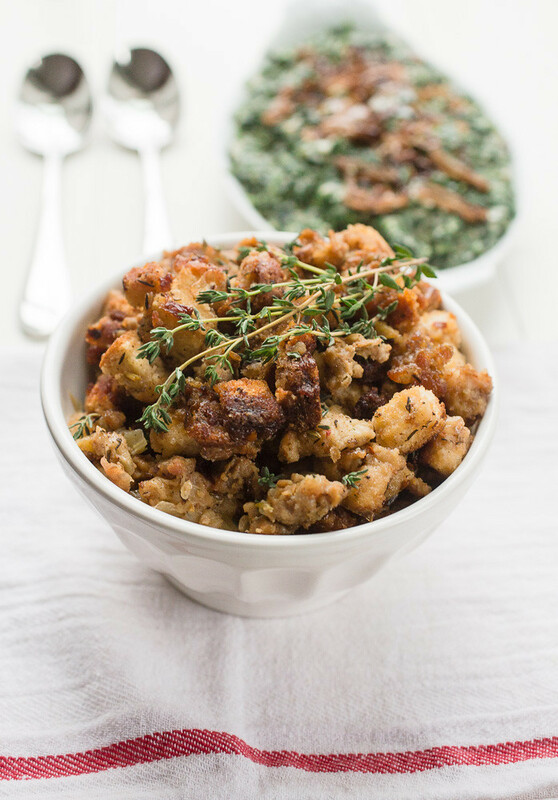 This is a classic turkey stuffing recipe made with dried-out bread cubes, crumbled sausage, and savory herbs. You could certainly add dried fruit like figs or cranberries as I did with my turkey roulade stuffing. Other great additions could be fresh apples, pecans, or butternut squash. But I skipped all of that and went super traditional with this version. 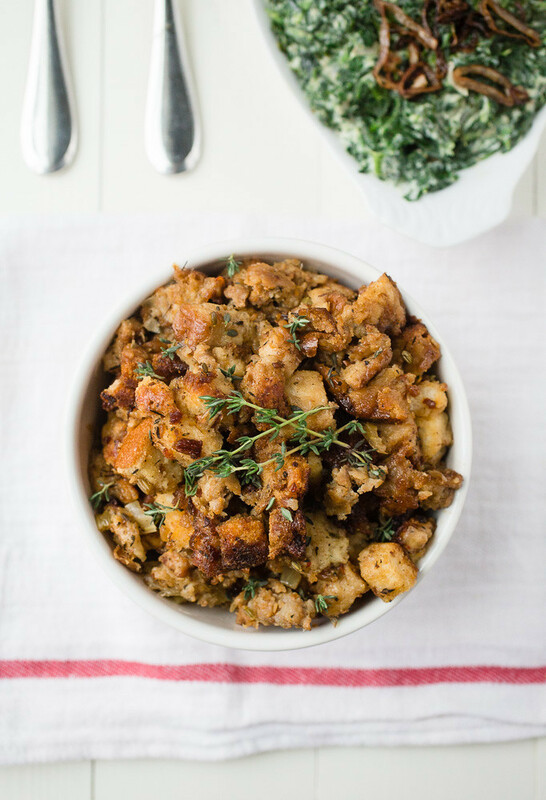 We loved this crock pot stuffing recipe so much that I’ve made is twice in the past 2 weeks! The first time, this make ahead stuffing cooked away for 4 hours while I did some work in the yard. And then I stuck a good ol’ chicken in the oven to roast for dinner. The perfect fall Sunday meal! And then I made it again while I made dessert and a few other sides for a fun sides-only dinner this past Sunday. We loooved this stuffing made in the crock pot! You can bet that I’ll be freeing up my oven space just so I can make this stuffing again for a Friendsgiving or on Thanksgiving day. Looking for More Thanksgiving Crock Pot Recipes? This stuffing is even better on the second day (YAY for leftovers!) so you may want to consider making it the day before Thanksgiving and reheating it with some extra chicken broth in the microwave before you serve it with the bird and all the fixings. If you can plan ahead a couple of days, let the bread dry out on the counter – this will prevent the extra step of having to bake the bread cubes to dry them out in the oven. I’ve made half of the recipe below twice and needed two large baking sheets (12×18-inches) to hold 1 lb of cubed bread. The full recipe will require four sheet pans and a whole lot of precious oven space. If you can plan one day ahead, consider my suggestion above to make this stuffing the day before Thanksgiving instead – the quality certainly will not suffer. Lastly to note, half of this recipe fits very nicely in a 4-quart crock pot. Use the same size foil collar that is recommended below. Adjust two oven racks to the upper and lower middle positions. Preheat oven to 250° F. Spread the bread cubes out over two large baking sheets and bake for about 45 minutes, until the bread is dried out on the edges and just a tiny bit soft in the centers. Let the bread cool on the pans for 10 minutes then transfer to a very large mixing bowl. While the bread is in the oven, ready a 6-quart crock pot by folding a 16-inch piece of aluminum foil into a 16 × 4-inch long rectangle, then lining around the back and sides of the crock with the foil. Spray the foil, bottom, and exposed front side of the crock with cooking spray. The theory behind using this foil collar is that the back side of many crock pots cook hotter than the rest of the crock does and the foil will help to insulate the stuffing, preventing it from cooking too fast or burning. Meanwhile, brown the sausage in a large skillet over medium-high heat for about 5 minutes. Transfer the sausage to the bowl with the bread, leaving the drippings in the pan. Add the butter to the pan, melt, and then add the onions, celery, thyme, and sage. Cook for 8-10 minutes, until the onions are lightly browned and softened. Stir in ½ cup of the broth and scrape up any brown bits from the bottom of the skillet. Immediately add the mixture to the bowl. In a large bowl, whisk 2 ½ cups of broth with the eggs, then pour this mixture into the bowl. Season with the salt and pepper. Stir everything in the bowl together until well-combined. Transfer the stuffing to the prepared crock pot, cover, and cook on low for 4 hours*. Turn the crock pot to the warm setting (if yours has this – or off it it doesn’t). If the stuffing seems dry, stir in up to another ½ cup of broth. Season with extra salt and pepper to taste. Serve hot. *Note: If your crock pot normally cooks hot, as some do – and you generally know if this is a problem with your crock pot – cook the stuffing for 4 hours then turn the crock pot off until you’re ready to serve the stuffing. Hotter crock pots, even on the warm setting, will likely overcook this stuffing – trust me. Thanks for coming back to comment, Julie! So happy to hear you loved it! Admittedly, I believe I finished all of the leftovers each time I made it this past fall. lol! Just can’t figure out the foil liner? Is it inside the crock? Or between the crock and sidewall of the slow cooker? Hi Louise! The foil liner goes inside the crock. Spray the side that will touch with stuffing with cooking spray to prevent the stuffing from sticking to it. Do you have images of what the foil liner looks like? I’m still a little confused on what to do. I don’t have any photos but it’s really easy to do. Take a long piece of foil, fold it over, and lay it flat up against the inside back “wall” and around the sides of the crock pot so that it wraps about 3/4 of the way around the inside of the crock pot. It should be pressed up against the sides of the crock pot, creating a barrier between the stuffing and the crock pot to prevent the stuffing from burning. I hope that helps to clarify! This looks and sounds absolutely delicious! Thanks for mentioning my spiced pear juice! If I make 1/2 the recipe then do I cut cook time in half or do I still cook on low for 4 hours. Hi Lisa, It depends on the size of your crock pot. I made half of this recipe in a 4-qt crock pot and cooked it for 4 hours on low. If you use a 6-qt crock pot for a half recipe, you’ll need to cook it for less time since you’re increasing the surface area of the stuffing that is in contact with the crock pot. In short, the internal temperature of the stuffing (at the center of the stuffing) should be around 165 degrees F. I hope this helps!